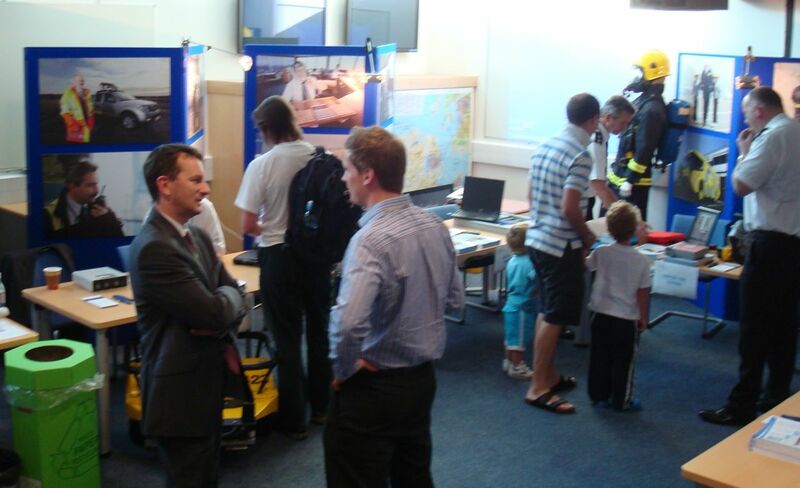 In the end, Belfast City Airport’s recent outreach event didn’t attract a lot of people over the terminal threshold to hear what the airport was up to. While 21,000 local homes may have received the regular airport newsletter, only 42 people turned up at the two half-day Community Information sessions run last week. As I blogged over on Slugger O’Toole, a bigger blow was dealt this morning when Michael O’Leary announced at a press conference in the Europa Hotel that Ryanair would be pulling out of Belfast City on 31 October, ceasing their routes to Bristol, East Midlands, Liverpool, London Stansted and Prestwick. (They're continuing to fly out of City of Derry airport.) O’Leary has run out of patience with the continued lack of runway extension and the delayed public inquiry. It’s unlikely that O’Leary’s intervention will speed up the process. More likely it’ll encourage easyJet to continue their bargaining between Belfast International and Belfast City airports and perhaps shift more flights down from Aldergrove to the harbour. In July, Ryanair announced a three-month suspension of flights from Bournemouth airport between 1 November 2010 and 31 January 2011, citing the government's £11 tourist tax. “While it is regrettable, it is not surprising, Mr O’Leary has long made his views known regarding the democratic right of the people of East Belfast to lodge their objections and lobby their elected representatives against a runway extension which would add to the already nuisance levels of noise and other forms of pollution. Mr O’Leary probably needs reminded that we live in a democratic country not a fascist state where profit is more important than the health and well being of its citizens. Update - I've embedded below a thirty minute documentary produced by NvTv a year or so ago about Belfast City Airport and the proposed runway extension. Wondering why there was a flood of hits on the blog coming from Iain Dale's blog, I discovered that - unbeknownst to me - Alan in Belfast had been entered into Total Politics vote for Top Northern Ireland Blog, and made it into the top 20. For what it's worth, AiB came 14th ... but I wouldn't put too much trust in the science or judgement behind inclusion in the list, never mind placement! Each year on the first afternoon of Tech Camp we tend to organise some kind of team-based activity to help the campers – who’ve come together from all arts and parts – to get to know each other. 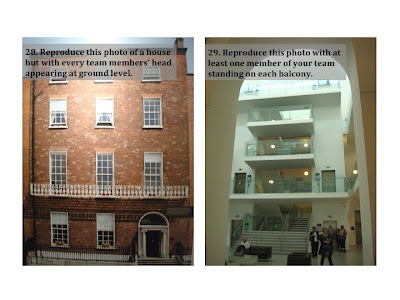 In previous years we’ve organised a couple of photo treasure hunts around Belfast. Last year we branched out with a GPS scavenger hunt to find clues deposited in small see-through tupperware boxes scattered throughout the city centre. Turned out that GPS was not such a good idea due to the tall buildings. This year’s photo treasure hunt was based in and around the recently-reopened Ulster Museum. The museum has a basic hunt (complete with stickers) for young children visiting the museum. But since there’s no organised version for teens or above, I went ahead and created one. The tech campers managed to complete all the questions within the 90 minute time frame, working in teams of 5-6. Feel free to adapt and reuse the questions below. 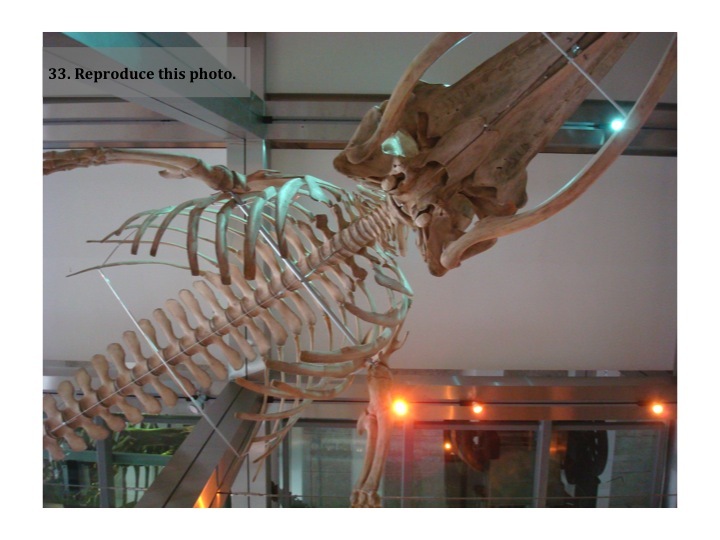 Question 21 may not be a long-term activity available in the museum. I’ve left the answers off this blog post. But if you email me at the address at the top right of the blog I’ll happily send you the questions and answers together with sample answer photographs. Enjoy. And thanks to the museum staff who helped suggest some of the questions. The hunt is split into three rounds, which you should complete in parallel. Answers for the first round take the form of words. The second round requires pictures of the requested items. And you need to take a photograph that matches as closely as possible the photographs I’ve supplied in the third round. If the question requires you to take a photograph of your team, one member (the photographer) is allowed to be missing. Bonus points may be awarded for particularly well framed or artistic shots, and marks may be deducted for out of focus answers. You have 90 minutes to complete as many questions as possible. The whole team needs to meet back down in the main ground floor atrium at the finish. Hand in your Round One answers immediately, and supply a Keynote or Powerpoint presentation with the Round Two and Three photos within half an hour of getting back to camp. keep your eyes peeled and enjoy yourselves. 2. How many carats is the museum’s ruby from Thailand? 3. In which country was the lunar meteorite found in 2001? 4. In which year was the Spanish Armada launched from Lisbon? 5. Ireland was a major glass-making country in Europe during the late _____ and _____ centuries? 6. What brand of projectors are widely used throughout the museum? 7. What’s the name of the Ulster Museum’s restaurant? 8. Which King’s forces were defeated in the Siege of Derry in 1689? 9. Which sea mammal has been known to eat giant squid? 10. Who paid for the building of Belfast’s second synagogue? 11. a cat and a dog together. 13. a hand with enormous finger nails that look like they have been bitten. 14. a museum member of staff laughing with your team. 16. a size 30 boot. 19. some carved hippopotamus teeth. 20. the car with registration IJ 285. 21. the decorated thumbprints of your entire team. 23. the towns and cities in Ireland with a population over 20,000 in 2001. 24. two of your team dressed up in historical costume. 25. your team standing in front of two giant deer. 26. your team standing on top of a table which has been set for dinner. The Great Belfast Art Hunt takes place on Saturday 28. 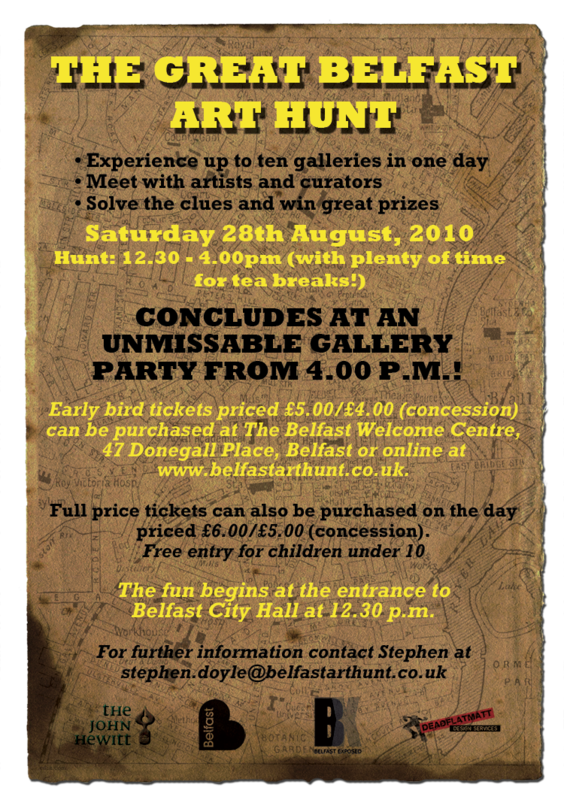 Starting at the entrance to Belfast City Hall at 12.30pm, solving the clues will take participants around ten galleries, meeting artists and curators, concluding with a party at 4pm. The Belfast Welcome Centre is selling advance tickets online and at their 47 Donegall Place for £5, or you can pay £6 on the day. No need to being a magnifying glass or a deerstalker. You can catch the last August Sunday afternoon Dock Walk around Titanic Quarter. Chris Bennett - chaplain to TQ - meets up with interested people at 3.33pm at the Odyssey Streat before setting off to walk, reflect and pray around the area. The Belfast Mela runs between noon and 6pm in Botanic Gardens on Sunday 29. With nearly everything covered by free admission and with over 30 countries represented, experience music, dance, circus acts in the bandstand, a sound garden in the Palm House, food, arts and craft stalls, henna and face painting, and more food. 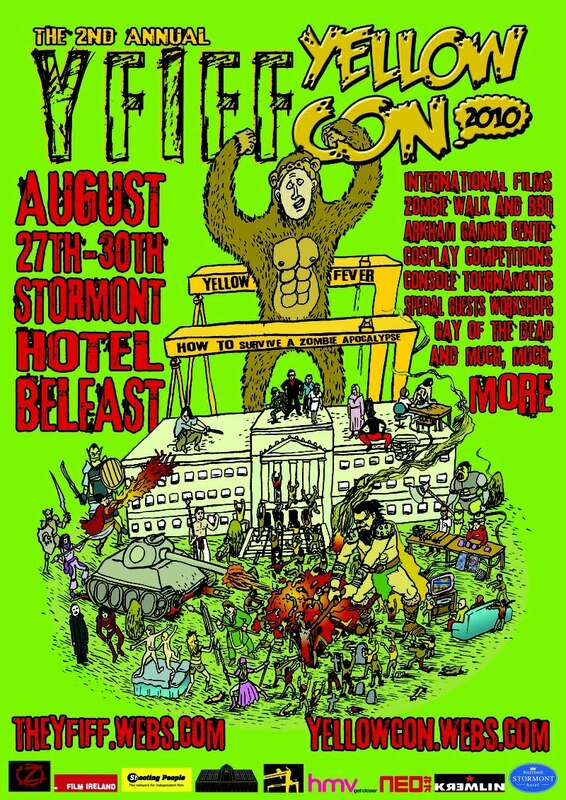 If zombies are your thing, then head across to the Stormont Hotel for the return of the Yellow Fever Independent Film Festival. Between Friday 27 and Monday 30 August, there’ll be screenings, premières, gaming, local short films and even a zombie charity walk. Independent films across all kinds of genre are represented, but with a heavy emphasis on horror. Belfast City Blues Festival is still on over the weekend. Lots of sessions in venues across the city listed on their website. This weekend, Lisnagarvey Youth Society (the junior wing of Lisnagarvey Operatic Society) are performing the rock musical Little Shop of Horrors in Lisburn’s Island Arts Centre. They’ve been rehearsing for this science fiction spoof all through the summer. Curtain up on Friday 27 and Saturday 28 at 7.30pm. Tickets available for £8.50 from the Island Arts Centre box office on 028 9250 9254. It’s also Hilden Beer & Music Festival at The Tap Room / Hilden Brewery this weekend. Details of gigs, BBQs and ticket prices on their flyer. And finally the Portrush Flyer steam train I mentioned last week is running again on Sunday 29, leaving Belfast Central at 10.30am for the two hour ride up to Coleraine and on to Portrush. George Best Belfast City Airport are running a couple of Community Information days this week to give local residents an opportunity to find out more about how the airport runs and its plans for the future. There’s another opportunity on Friday morning (27 August) between 8am and noon. Just go into the airport Information Desk and they’ll direct you to the conference room. In light of the continued saga of the runway extension and the (delayed) public inquiry, not to mention the vocal campaigning by the Belfast City Airport Watch Ltd and other residents’ groups, the timing of the community engagement was no accident. I popped along this evening. After years of manic travelling with work, the airport is no longer such a familiar destination. So it was interesting to see the changes inside the terminal building that have happened since I last flew out. Staff from each area of the airport’s operation were available to talk about flight paths, the community fund and the recent terminal extension. Environmentally, BCA are putting a lot of effort into increasing the level of recycling across the airport site as well as reducing their energy consumption. Around 6% of airport passengers arrive by bus using the regular (and reliable) Metro service. An incalculably small number arrive by train to the Sydenham stop in front of the old terminal entrance and request the car park bus to ferry them across to the new terminal (or walk over the bridge and along the footpath). The Belfast City Airport Forum first met in March 1993. Membership of the forum was revised in 2009, and the minutes of the new group’s first meeting in March 2010 are available online. The quality of the runway surface and the groves running across it are tested frequently to ensure it meets standards and will supply sufficient friction to support planes braking sharply on landing. BCA’s bird management plan extends far beyond the airport’s perimeter and tries to reduce the likelihood of birds crossing the path of flights. The CAT I instrumentation landing system supports planes coming into land over Belfast Lough. When the current equipment shortly reaches the end of its life, the replacement will be installed at both ends of the runway (and will be CAT III capable in case the airport switch to that at a later date). As well as keeping two fire appliances on standby to cope with emergency landings and fires within the airport complex and the local area, BCA’s Fire and Rescue Service help train other emergency crews using their gas-powered hot fire rig, and deliver training courses within the community. Staff were keen to talk about the runway extension. Adding 590 metres to the Holywood end of the runway would allow the existing aircraft to fly fully laden with passengers and fuel, offering destinations further afield in mainland Europe. BCA’s current planning constraint means it can operate no more than 48,000 flights each year. Last year they managed 39,328 flights carrying 2.60 million passengers; in 2008 they peaked at 42,998 flights for 2.56 million people. There is a fear that the longer runway would result in larger planes starting to operate from Belfast City Airport. BCA say they have no plans to allow carriers to use larger planes. They also point to the geography of the airport and the physical impossibility of parking larger airplanes on stands given the location of the runway and the terminal building. Jumbo jets wont fit! While the open night was relatively quiet while I was there, it was beginning to get busier as I left. Young children were trying on a yellow fire-fighter’s helmet while local residents were getting their questions answered directly by airport staff. Liz Fawcett – chair of the Belfast City Airport Watch steering group (who aren't named on their website!) – popped in too to get some clarification on flight path reporting and runway extension issues. It was interesting to hear one Holywood resident describe the reality of the noise of the first aircraft taking off each morning, but then reflecting that it was really handy having the airport just down the road! As a major employer – around 1,500 people work at or in support of the airport – an irritant, and the gateway to holiday destinations and meetings in London, the airport’s engagement with the local East Belfast and North Down communities seems wholehearted and positive. And waiving the car parking fee was a nice touch too! 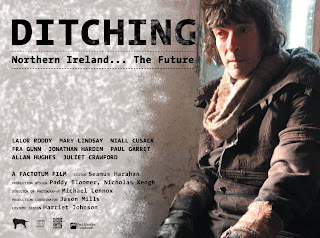 Ditching is a locally written film produced by the Factotum arts cooperative (who also publish The Vacuum). 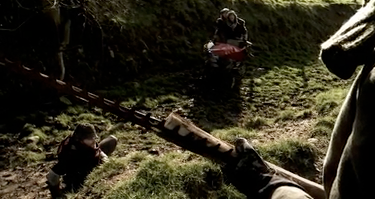 It’s set in post-apocalyptic Northern Ireland where walking is once again the only mode of transport. There’s no mains electricity. Food is used as currency. It’s a feudal society, with military brigades dotted around the countryside. Derelict buildings lie in ruinous disrepair. Animals are scarce. The film follows Maeve (Mary Lindsay) and John (Lalor Roddy) as they slowly journey across the landscape, pushing a trolley containing their few possessions and supplies. The man’s health is failing. Along the way they pick up a troubled mapmaker and a soldier. In many ways it’s like time has rolled back several hundred years. Except that objects from the present day remain in the landscape: pylons, tea pots, Osrams (which we tend to know as “bulbs”). But the context of how to use them and what their purpose was has been lost or at best confused. 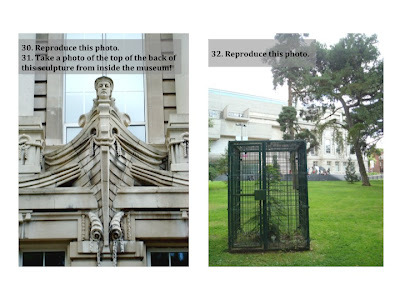 It’s not just objects that remain visible in a decontextualised state. There are tell-tale glimpses into practices and events from the past that live on in new adapted customs and rituals. Prayer is still part of life, but despite lying on the ground in a star shape, it’s no longer directed at God. There’s a great scene when the couple come across a rag bag army with hedge sheer blades mounted like bayonets on their improvised weapons. A game is organised. It begins with two men challenging each other to interpret their riddles. Then it moves on to a bout of outrageous name calling. And finally, the two men stand either side of an improvised barrier (a big green sheet) and fling ever-stranger objects over at each other. The aim is to catch them. A man wearing a balaclava sits in the middle and calls out “foul” or “catch”. An old telephone is heaved over first. Later a dead dog fox. A burning branch is chucked over. All the while the observers cheer on the two men by banging on metal objects. Clear references to the political, prison and paramilitary activity in Northern Ireland over the past thirty or more years, knitted into a new situation. The cinematography feels like a rural version of urbex photography. Where did the Factotum find so many derelict buildings? 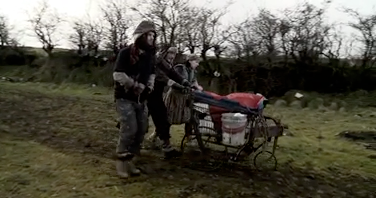 The imagery – particularly pushing the trolley along lanes and through fields – reminded me of the journeying found in Bergman’s The Seventh Seal and the mother and son trudging through the countryside in Katalin Varga. There are countless nods – perhaps not all intentional! – to other films and programmes. 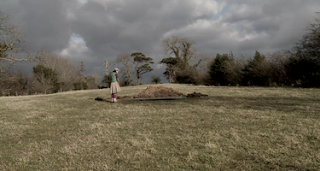 As John and Maeve pick up travellers along their way and end up with the house of the Priestess it’s very Wizard of Oz without Toto. The characters who wander across the shot pushing a huge tractor tyre (“there’s good burnin’ in it”) are very Monty Python. 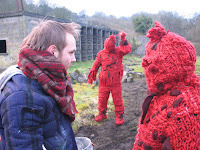 And there’s definitely something of Blake’s 7 in the cannibals clothed in red knitted wool from head to foot as well as the woeful incidental recorder music near the end. It is obviously a film made on a low budget, with a small cast, but high production ideals. 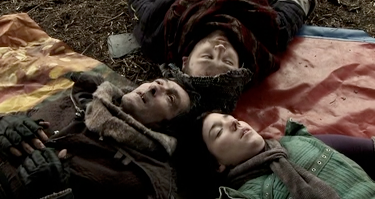 Despite the odd jump between shots, and unexpected changes in sound level, it’s very well constructed, and the lack of complicated plot (basically, he’s dying, they're on a quest to find medicine, and everyone they meet is disturbed) is a deliberate device rather than a failing. As a film, Ditching begs to be analysed. How much of today’s customs and rituals across Northern Ireland are misunderstood and no longer contextually accurate reflections of past events? How much are we slaves to our past without realising? And like the not so hungry Aran-clad cannibals in the film, does our fear of others come from what we’re told rather than what we actually experience? 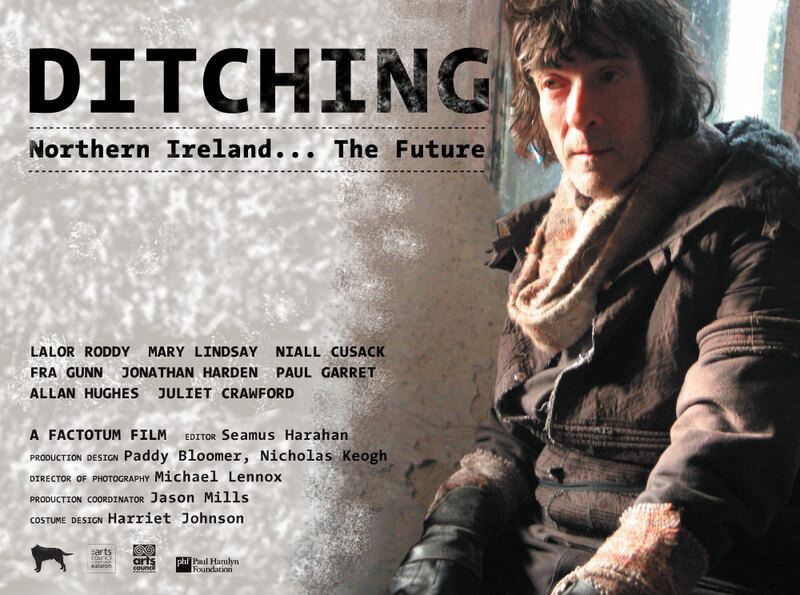 Ditching has previously been screened at the Belfast Film Festival and run in the Queen’s Film Theatre. Hopefully it’ll get other opportunities to be seen by a wider audience and the future can be used to ask people questions about how the past influences our present. This report on the BBC’s News website about school children returning to programme in Acorn's BASIC is nearly enough to send me up into my parents’ attic to dig out my old BBC Master and floppy drives. Amazing what you can do with a Flip camera! Graham Love goes to school in Aberdeen and makes great short videos using pocket-sized Flip video cameras (of which I'm fond). I've embedded three examples. As well as being fun and fulfilling, each year’s Tech Camp offers a glimpse into the impact of technology on ever-changing world of teenagers. In previous years, a minority of campers have brought along their own laptops. This year, the vast majority were inseparable from their lap warmers. In previous years, late night conversations down the campers’ corridor could be easily detected from the other side of the building. They would congregate in someone’s room or the communal kitchen. This year, there was no need to shhhh them. There were still bleary eyes in the morning … but from the tap tap of keyboards and late night MSMing between each other rather than face-to-face chatter. It’s already the case that some parents of campers will be more likely to confirm that their children are alive and well by monitoring Facebook than expecting a phone call home or even a text message. Over the years there has also been a notable increase in the ability to shoot and edit video. And perhaps an improving understanding of film grammar – though few would express it that way! The kind of technology that the leaders share and guide them through during the week is becoming less surprising. There’s still much to learn and apply, but the magic is diminishing. Perhaps one exception was our visit to SARC – the Sonic Arts Research Centre at Queens University. Stereo sound, surround sound, but few have contemplated – never mind experienced – the kind of all-encompassing surround sound diffusion set-up in SARC’s Sonic Laboratory. Audiences and researchers enter the lab at ground floor level and walk out onto an acoustically transparent, modular grid floor suspended 4m above the structural floor of the lab located at lower ground floor level. 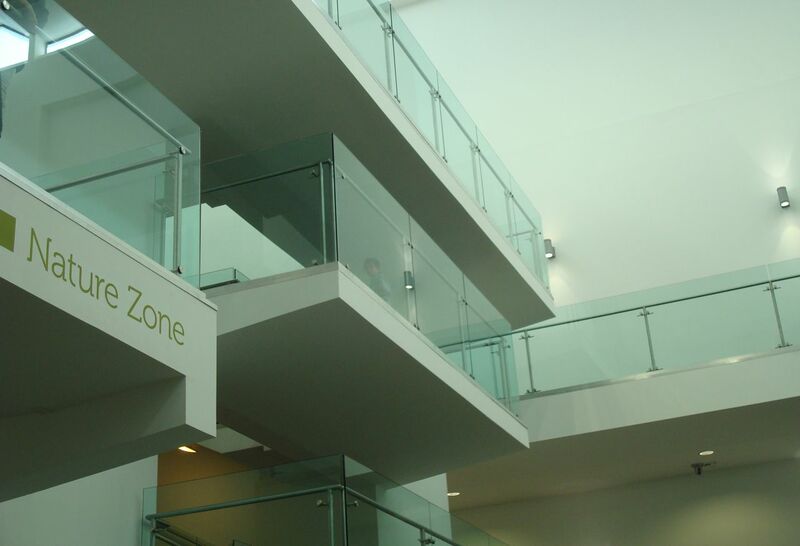 Approximately 7m above the audience area is a technical gantry spanning the perimeter of the lab and nine motorised ceiling panels which can be independently lowered to ground floor level. The ceiling panels are rectangular aluminium box trusses (2m x 1m) from which loudspeakers, stage lights and/or microphones can be suspended. With over sixty speakers positioned around you as well as above and below, you can perceive sounds moving around you in a way not possible with headphones or even a sophisticated cinema setup. As I said, Tech Camp is a reminder that technology is changing. 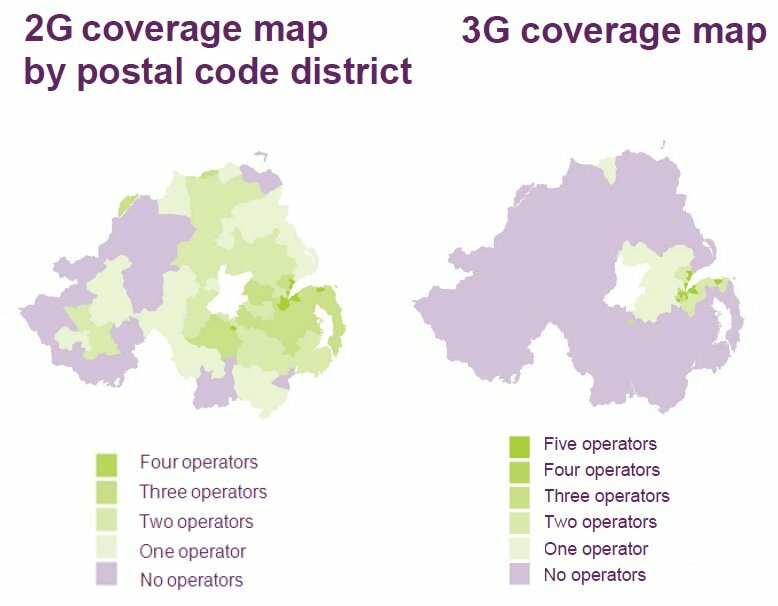 So too is the annual Communications Market Report for Northern Ireland published by Ofcom. I’ve blogged about previous years’ reports, so will just point to some of the changing patterns in communications that are highlighted in this year’s tome that was released on Thursday morning. Over the past few years there’s been a gradual increase in the number of households which don’t have fixed-line phones. Sometimes down to short term rentals, student housing, lack of finance. But also likely to be a sign that for some people, mobile coverage and mobile broadband (as well as other places they can get online – work, perhaps – or scrounge wifi) means that they can live without a landline. 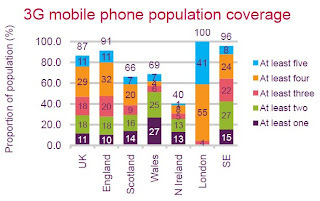 18% of NI households are now mobile-only (21% of urban households) compared to 14% across UK. 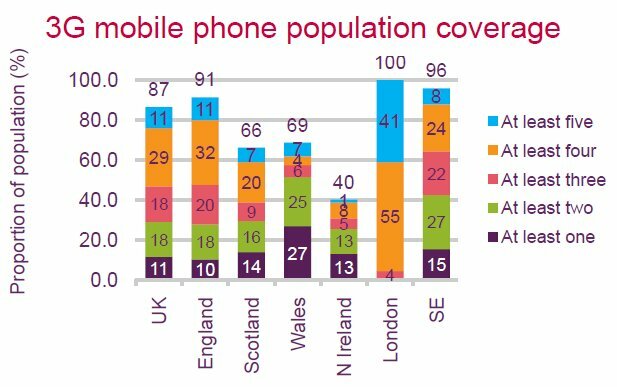 3G coverage is a mere 40%, lagging far behind the UK average of 87% and lower than Scotland (66%) or Wales (69%). The coverage map confirms many people's impressions of 3G coverage. No surprise that use of 3G handsets is lower (18%) in NI compared to the UK (26%). After years of lagging behind, the percentage of NI households with broadband (70%) has caught up with the UK (71%). But we like our electronic gadgets! NI is the gaming capital of the UK with 52% of NI households having a games console (PS3, Wii or Xbox 360). It’s the same pattern for hand-held portable consoles (DSi/DSi Lite or PSP): 37% of NI households have one compared to 30% across UK. Though Microsoft marketeers should note that Xbox is less popular that other parts of the UK! 37% of NI adults use an iPod/MP3 player (compared with UK average of 32%). For people living in the Belfast metropolitan area, that rises to 42%. The household ownership of iPods/MP3 players (45%) is five percentage points higher than the UK average. While I've been looking at the Northern Ireland report, versions are available for England, Scotland and Wales as well as an overall UK edition. This year, as well as the 137 page PDF report, Ofcom have also released a summary of the base data, PDFs of the charts, and created (SEO-friendly) web pages for individual sections. At the same time, they've hugely increased the number of spelling mistakes and formatting errors in the main report! Something else for the weekend - what about taking the steam train up to Portrush? 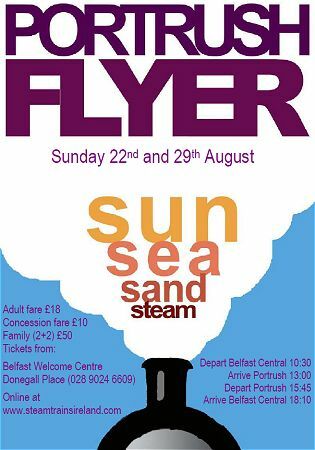 After three years of poor railway track condition between Ballymena and Coleraine, volunteers from the Railway Preservation Society of Ireland are running their Portrush Flyer again over the next two Sundays (22 and 29 August). The society's steam train will leave Belfast Central at 10.30am, passing through Ballymena at 11.40am and arriving in Coleraine at 12.35pm. Track condition means that the last 6 miles still needs a switch to a modern diesel, arriving in Portrush by 1pm. The return journey leaves Portrush at 3.45pm, arriving back in Belfast Central at 6.10pm. During the afternoon they're also offering a shorter steam run between Coleraine and Ballymoney (and back), leaving Coleraine station at 2.40pm and returning an hour later. The RPSI website gives details of prices and links to online booking. Belfast is the libel capital of the world – Britney Spears took action through Belfast courts a few years ago – and now Northern Ireland is to remain the towing and clamping capital of the UK. This leaves NI as the only part of the UK where someone can be punished for parking without permission on someone else’s land. There’s also no sign of similar legislation being introduced in the rest of Ireland. I recently met the owner of the car I snapped being lifted and towed ... small world! 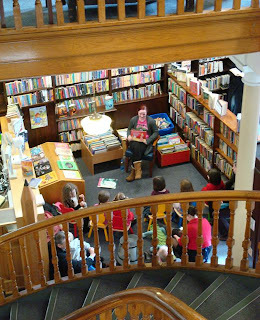 Linen Hall Library's monthly Children's Story Time is running this Saturday (21 August). If you're 4-7 years old, then take your place on one of the small chairs in the children's book corner by 11am for half an hour of great story reading. Accompanying adults get a chance to wander around the fascinating library, recharge in the second floor café, or loiter and enjoy the stories. Advance warning that September's Story Time will be on the 11th at the later time of 11.30am - part of the library's European Heritage Open Day events which include tours looking at its "colourful and tumultuous history" at 11am and 2pm. As well as the well known St George's Market on Saturdays (9am - 3pm) and Sundays (10am - 4pm), you'll find a smaller farmers' market - the market is smaller, rather than the farmers! - in the car park of Belmont Tower (82 Belmont Church Road, BT4 3FG) from 9am on Saturday. Expect to find stalls offering fruit & veg, meat, fish, bread, cheese and olives. The Belsonic music festival is running at the moment in Belfast's Custom House Square ... but there's nothing this weekend! There are more and more sounds of life in Belfast's Titanic Quarter. Buildings are springing up, businesses are moving into office blocks, and a community is starting to form. 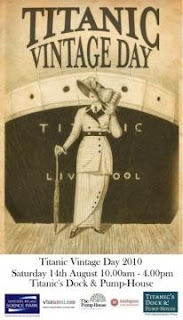 Saturday 14 August is Titanic Vintage Day, with "a vintage car show, a vintage fair, a photography competition, bouncy castles, face painting, Living History tours" amongst other attractions between 10am and 4pm mentioned on the Titanic's Dock and Pump-House website. Chris Bennett is chaplain to TQ and blogs about his progress and activities over on The Dock. He'll be in the Pump House cafe at 11am if people want some company as they explore the sights. This Saturday isn't the only way to explore TQ. There's a Dock Walk every Sunday, leaving the Streat in the Odyssey at 3.33pm. And there's even a book group! Brush up on your Chopsticks! Street pianos have been around for a quite a while, but now they're coming to Belfast. Craft NI have a large programme of events during August, which started with the yarn bombing of the sheep in front of the Waterfront Hall. Their next wheeze to make us smile and enjoy our normal environment is a musical art installation “Play Me, I’m Yours” by artist Luke Jerram. Ten street pianos will be left on the streets and in the parks of Belfast between 14 and 28 August for anyone and everyone to enjoy: Belfast City Hall, Commercial Court, Corn Market Sculpture, Cotton Court, First Presbyterian Church, Linen Hall Library, Northern Bank Building, St Anne's Square, Tesco on Royal Avenue, Writers Square. "The pianos have been rescued, restored to working order and decorated by local artists, community groups and charities, all of whom have offered their time for free. This is the first time the artwork has been presented in Ireland." The Play Me I'm Yours website for players and listeners "to post their comments, films and photos about the pianos." At the end of the two weeks, the pianos will be donated to local schools and community groups ... or stolen and moved into student flats! Recently a 30m x 20m labyrinth of laurel and thuja hedges was built in London's Trafalgar Square. (I'm glad to see that this public space is still being used for madcap schemes!) People were being encouraged to enter the maze and explore the different parts - named after areas of the West End - and make their way to the entertainment being showcased in the middle. Belfast's city centre has turned into is a bit of a maze too. It takes a lot to re-route parades in Belfast, but the Department of Social Development's four year Streets Ahead project to tart up Belfast's street-scape has managed to keep both the Twelfth marchers as well as Gay Pride from walking up Royal Avenue past the front of Marks and Spencer. These days, trying to navigate your way from Burger King to WH Smith and then across the road to Boots nearly requires the kind of GPS set-up you can see in my previous post. 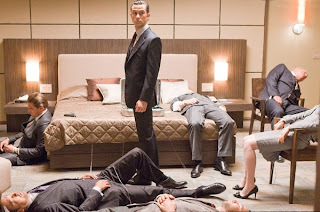 There’s been a lot of hype about Inception, and the general plot device of conspiring to plant an idea inside someone’s dream (or inside a dream in a dream) was as well seeded in the public’s consciousness as it was in mine. 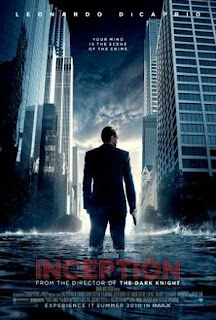 As the film opened, I wondered if it was about to become a harsher, less sandy remake of the Prisoner? Later I wondered why Juno (the actress Ellen Page playing the character Ariadne) had turned up studying in Paris? The first half introduces the context of why the second half’s mad mission is required. It also sets up the themes of guilt and longing for redemption in some of the main characters: Dom Cobb (played by Leonardo DiCaprio) and Robert Fischer (Cillian Murphy). I loved the moments of sedate confusion throughout the film. At times it lapsed into an n-dimensional, gravity-free Matrix. 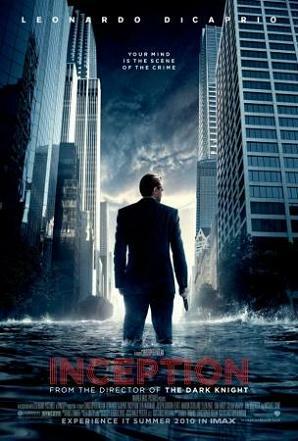 But I was glad that although the characters could muck around with the world and bend cities back on themselves, they generally didn’t resort to Inception’s equivalent of Doctor Who’s sonic screwdriver. Screen playwrights, film producers, set designers, sound and foley editors … they all create dreams on the silver screen that draw us in to their fantasy worlds, placing images and emotions and plights in our psyche. Understanding that takes away the craziness that others have wrapped around Inception. It’s a good film. No one left the screening to go to the loo! And clearly Christopher Nolan and the film’s makers were successful in constructing and conveying such a convoluted plot in such a straightforward way. The physical linkages between the levels of dream are clear and clever – I loved the effect of the van swerving, or of water splashing the sleeping faces. The snow level stood out visually. Took me right back to the revolving restaurant at the top of the Schilthorn high above the Swiss village of Mürren. Before its completion, the location was used as the set for the Bond film On Her Majesty's Secret Service. After all the dark wood-panelled sets and cityscapes in Inception, the snow was nearly too bright to handle. Without such a startling difference in tone, the levels would easily have fused together. But it seemed to come from nowhere, with little linkage back to anyone’s history. The ending was partly unsatisfactory. The scene in the plane was too sudden and too unexplained. And the spinning totem – linked back with Michael Caine – was like The Italian Job all over again. Caine and Postlethwaite in the one film? Felt clichéd. And there was never any rationale proposed to explain why the mark was a justified target. 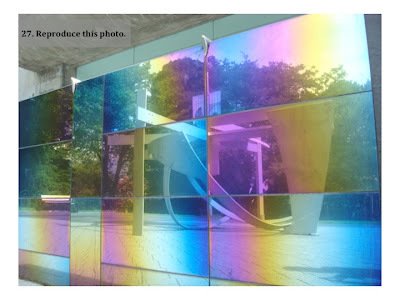 The video installation "crossroads (what to do)" deals with the influence of others onto one's own path of life in an abstract way. There's something very mesmerising and poetic about this. All of those calm, electronic voices in a sort-of rhythm. I don't know if it would have the same effect if it were in English; you don't need much German to understand it, but the language difference does give you a little bit of distance. The time taken to internally translate shifts them from a series of instructions to a flow of narration. PS: Check out another of Hilary's recommendations - 35 films in 2 minutes. Actor and puppeteer Caroll Spinney has been the man inside Big Bird and the man behind Oscar the Grouch for over 40 years. He’s been over in Belfast (with Oscar) for the last couple of days, working on the local Sesame offshoot Sesame Tree which is currently filming its second series (for transmission towards the end of the year on CBeebies). If you’ve been reading this blog for a while, you’ll remember faintly recall previous posts about the broad-speaking Hilda and Potto (who has a Big Whizzing Machine), the Bookworms (Samson and Goliath) and the Weather Berries who all inhabit the local version coproduced by Sixteen South and Sesame Workshop. Sixteen South have another children’s show – Big City Park – that’s just started to feature daily on CBeebies. It’s “a celebration of being outdoors” and was filmed with local children in Belfast’s Ormeau Park. Given a chance yesterday to interview Oscar, I found the grouchy, hoarding, grubby green character in surprisingly good form. He explained he was over in our big smoke to visit his distant cousin Potto. Muppets are very like children. They’re attention piranhas, and you can’t not look at them. While Caroll’s mouth was clearly moving, I found myself looking Oscar in the eye when talking to him. He can misbehave too: if you listen to the clip below, you’ll hear Oscar swipe at a flea in the middle of an answer! Landing in Belfast proved troublesome as they just kicked him out of the plane somewhere close to the city: “I bounced a while, got some new dents in the trash can”. So what’s the best thing that’s been thrown in his trash can? Oscar was originally orange, but later turned green. I asked him if it had changed his outlook and if he recommended it? He explained that his transition had been due to a nice wet holiday in his favourite resort. After Oscar had gone, I talked to Caroll Spinney and his wife Debra. (You can hear some of the conversation in the second embedded clip.) An artist and a cartoonist, Caroll worked in animation (and had a job offer from Disney) before meeting Jim Henson and joining Sesame Street. It sounded more like a vocation or a calling than a career. So what does Caroll think is the ongoing legacy of Sesame Street? He points to educational research and the show’s innovative approach. Caroll talks very warmly about our local Sesame Tree and the skill of its puppeteers and how it compares with other international Sesame shows. Turns out that while Oscar is grouchy, his negativity isn’t ever meant to be nasty. You can hear Oscar and Caroll talking to Marie-Louise Muir at the beginning of last night’s Arts Extra (available until 12 August), see him wish Maggie Taggart a rotten day on Newsline, and catch Big Bird and Oscar’s musings in Caroll’s book The Wisdom of Big Bird (and the Dark Genius of Oscar the Grouch): Lessons from a Life in Feathers. This post was brought to you by the letters A, I and B. Back in April 2008, I posted about the Sky1 announcement that they were going to remake the classic science fiction series Blake's 7. "Following the development process we have decided not to produce Blake's 7, however, Sky continues to invest heavily in original drama and it remains at the heart of our plans." “SKY deciding to not proceed with the planned TV revival of BLAKE’S 7 is obviously disappointing, but the development process has resulted in the dynamic reinvention of this ‘branded’ series. As SKY were the minority broadcaster, there is a huge opportunity for investment in a TV series that is fully developed, has genuine global appeal and has exciting 360 degree exploitation opportunities. With much praised scripts from lead writers Richard Kurti and Bev Doyle (Going Postal) and 60% of the finance already in place, by anyone’s standard we have pulled together a compelling package. It's gone from a remake to a reimagining and now a reboot ... what next?